The National Biodiversity Assessment (NBA) is a product of high scientific importance led by the South African National Biodiversity Institute (SANBI) in collaboration with the Department of Environmental Affairs and several other partner organisations. Download a flyer about the National Biodiversity Assessment here. The purpose of the NBA is to assess the state of South Africa’s biodiversity based on best available science, with a view to understanding trends over time and informing policy and decision-making across a range of sectors. The NBA is central to fulfilling SANBI’s mandate to monitor and report regularly on the status of the country’s biodiversity, in terms of the National Environmental Management: Biodiversity Act (NEMBA, Act 10 of 2004). The NBA endeavours to capture the challenges and opportunities embedded in South Africa’s rich natural heritage by looking at biodiversity in the context of social and economic change and recognising the relationship between people and their environment. The NBA deals with all three components of biodiversity: genes, species and ecosystems; and assesses biodiversity and ecosystems across terrestrial, freshwater, estuarine and marine environments. 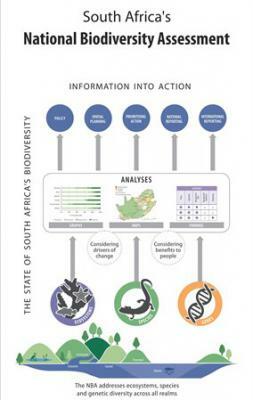 Status: How is South Africa’s biodiversity doing at ecosystem, species and genetic level? Trends: Are ecosystem, species and genetic diversity doing better or worse? Are we responding effectively to the challenge of managing and conserving biodiversity? How is society benefiting from biodiversity? NBA 2018 (to be published in 2019) follows from the National Biodiversity Assessment 2011 (published in 2012) and the National Spatial Biodiversity Assessment (NBSA) 2004 (published in 2005). The NBA 2011 Synthesis Report also formed the basis for a much shorter report titled “LIFE”, aimed at a popular audience and the general public. The Technical Reports and various synthesis reports for the last two assessments are available from the BGIS website. The NBA process takes approximately five years, and involves wide participation from stakeholders, scientists and biodiversity management experts throughout the country. A Core Reference Group for the NBA overseas the entire project, while technical component teams undertake the key scientific and technical work for each component (e.g. terrestrial, freshwater, wetland, estuarine, genetics, invasive species, species, etc.). Multiple workshops and reference group meetings are held for each component of the NBA, and discussions at South Africa’s annual Biodiversity Planning Forum bring together more scientists, practitioners and managers. All of this work culminates in the Synthesis Report, the popular report, the component reports, peer-reviewed papers in journals, and data and metadata – all of which is made public. Focus areas for offshore protection… and more. Maphale Matlala is a candidate scientist involved in several aspects of the NBA, with the speciality of ecosystem classification. Many other people are involved in NBA 2018 – including people who provide data, people who participate in important workshops, authors and reviewers. 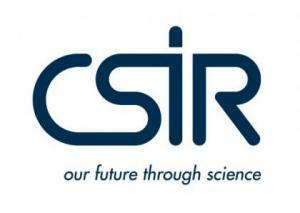 A crucial partnership between SANBI and the Council for Scientific and Industrial Research (CSIR) is in place for NBA 2018. Please visit the CSIR webpages at the freshwater and estuarine links here. relate to a situation at a particular time in a certain geographical domain, and in most cases are not designed to provide time series indicators. The NBA is thus unusual in its focus on indicators that should be assessed periodically and that will remain consistent from one assessment to the next. The NBA is also unusual for an assessment in that it does not simply synthesise existing science but also generates new science not previously published.